Wow, right? You did watch the video, yes? It is perfectly okay to click and watch again. It’s fast, it’s dense, and it’s deep. There’s a lot in there. Totally understandable … to want to watch it again! Okay, now back to pondering in the mundane world of work. But heads up — there are patterns at work! And I’m betting you’ve seen this all before too. Y’know, when leaders seek to centralize power, authority and decision making, presumably to increase control and efficiency, only to shift at some point and decentralize, presumably to enhance customer centricity and responsiveness. Or y’know when leaders reorganize resources to strengthen the contribution of functional expertise, only to reorganize again to enhance the coordination of the specialist functions with the operational components of the system. 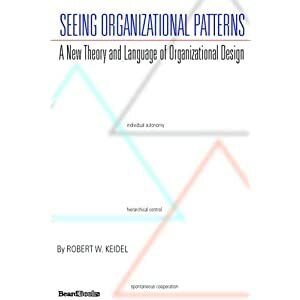 What all this looks and feels like from inside the organization — what you and I experience and feel — is confusion, frustration, and stress … we perceive so much of it to be unnecessary, unproductive change, driven by leaders with one-size-fits-all management philosophies or covert political agendas … and, watch out! we start noticing our lunch conversations are increasingly taken over by our complaining about this or that or more generally bemoaning the current malaise of the culture. And it should go without saying, but I’ll say it — all this is very definitely a drag on organizational performance. Which, insidiously, creates that much more pressure to — you guessed it — reorganize. This recurring (incessant?) shape-shifting used to really piss me off. And I was a willing participant in those devolving lunch conversations. But now that I’ve banked thirty-four years spanning several different industries in several for-profit enterprises while also sprinkling in some consulting for a few non-profit organizations and doing a three year deep dive into graduate studies to earn my masters in O.D. and experiencing these dynamics from several different positions and levels inside those workplaces… I can say that I see differently. Where I once was blind, now I can see. I can see the patterns. And I now understand that the ubiquity of these organizational shape-shifts is natural, not to be (in most cases) attributed to leader power grabs or some other ill intention, but simply to the response to current system conditions, a minding the gap analysis action. And it makes me feel optimistic. It makes me feel that if we can help everyone see the patterns and not just the event (the current restructure) and if we can then depersonalize our discussions of why the patterns exist, then, maybe we can mitigate the confusion and frustration and stress and anxiety and the drag on performance… and slow down the cycle. Anything is possible. Even perhaps a whole lot less fighting the physics? Perhaps new patterns can be created. Perhaps we can produce new and better options for how organizations can evolve and grow. Seeing the patterns and understanding them is to me as it is to Jason Silva, beautiful stuff; for I envision the adjacent future as beautiful when we can all work together to produce patterns of productive change. John – interesting – sorry I’m behind in my reading. 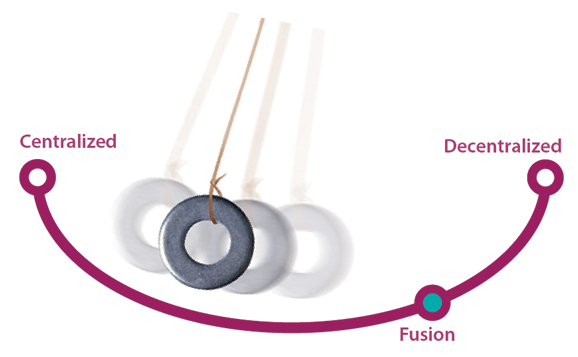 Is one way of slowing down the cycle shortening the pendulum swing? As we recognize the patterns can we then move ever closer to equilibrium, or return to equilibrium more easily? This is a tough one. Shortening the pendulum swing seems to produce more frequent shape shifts; not sure that’s a good thing. And I’m not sure returning to equilibrium is the goal, easy or not. I was envisioning this thought-post as more around change management, and moving quicker from resistance to adaptation if we all realize that these kind of changes are systemic cycles. Because when there is prolonged resistance and unmanaged change, productivity suffers and quality suffers, which generates pressure in leaders to make further change. That’s the part that I’m hopeful we can mitigate or eliminate. But I need to think more and harder on your equilibrium thought.